While on my latest trip to T.J. Maxx, I scored an awesome deal on this Color Club nail polish duo, which contains two holiday inspired, glitter-infused nail colors, from their Winter Affair holiday collection. I couldn't leave these two beauties behind when I first spotted them. Just how darling are these shades for the holiday season? There is something about the holidays that always has me craving glittered nail colors. They are so glam to sport during this time of the year as an accent touch. I just can't get enough! Let's take a closer look at these two beauties! (note: nowhere on this set did it indicate the names of these two nail colors. But after doing a bit of online research, I found out that the purple glitter one is called "Gift of Sparkle", and as for the clear glitter based one, I couldn't find this shade anywhere online. So, I am not certain what the name of this one is. For the purpose of this post I am going to refer to this polish as "clear"). This set was just $3.99! I love a great bargain! Gift of Sparkle: Purple infused with holographic glitters. I don't think I have a purple holo like this one in my collection so, I am glad to finally be able to obtain one. The plethora of colors that the holo glitters impart are simply stunning! You can layer one coat of this over your favorite purple nail color, or you can sport gift of sparkle on it's own, as it is opaque and rich enough. One coat provided sheer coverage, but 3 coats did the trick to even things out, and completely cover the nail. This one does feel pretty textured and gritty on the nails once dried, so I suggest applying a clear top coat to help smooth things out a bit. Also, the finish of this one is sort of on the matte side, so again, a shiny clear top coat will come in handy to liven the color a bit more. Clear: Iridescent round glitters embedded in a clear base. Worn on its own, this one gives a pretty dainty look to the nails, but wow, does this beauty stand out when layered over other nail colors. The glitters take on a different effect, that adds a fun kick to the nail color it is layered over-as shown in my nail swatch picture above. It's so interesting to witness. It reminds me of Essie's Shine Of The Times, actually. In order to get the most glitter particles on the nail bed, I suggest lightly patting on the glitters with the brush, instead of swiping it on. This tip always comes in handy whenever I am dealing with sparse glitter placement. Overall: These two nail colors couldn't have been a better addition to my nail polish collection. They are both unique shades to me, that I am really happy to have. They are both beautiful but, I have to admit that I am most excited about the clear iridescent one. It's such a versatile shade that's super fun to experiment with. I absolutely love it! 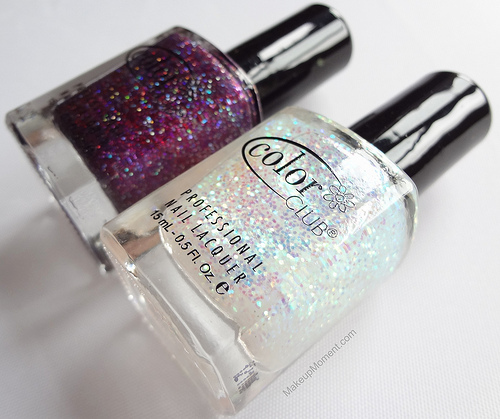 What do you all think of this Color Club nail polish duo? Which are your favorite Color Club nail colors? Thanks, hun! Are you a fan of glitter nail colors? Pretty color and great steal! Gift of Sparkle looks really gorgeous!